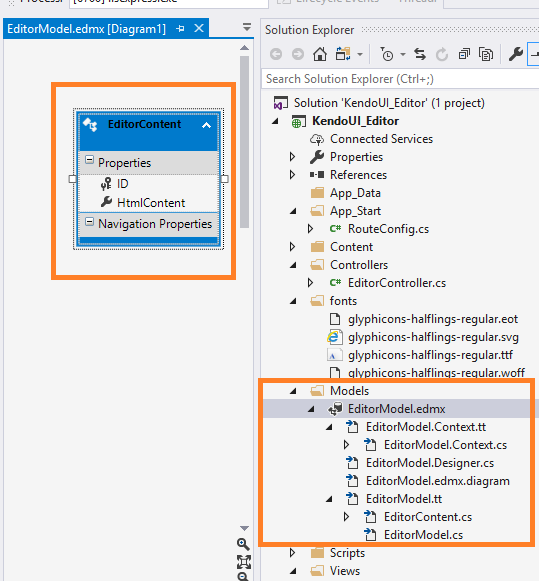 In this article, we will see how to work with Editors and customize these using Kendo UI in ASP.NET MVC5 and Entity Framework. 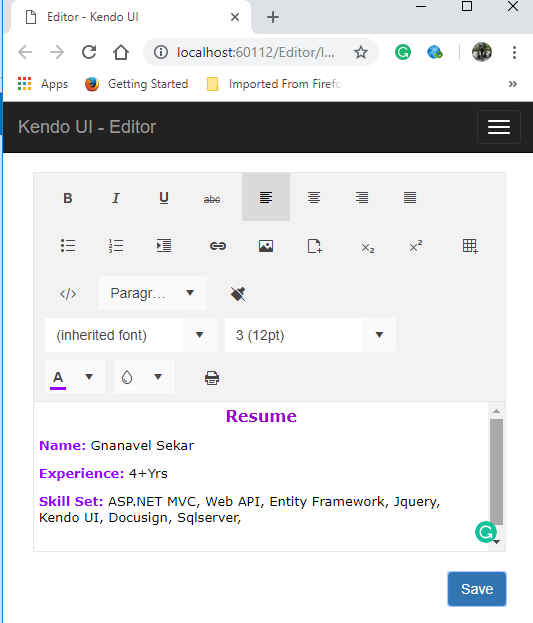 In this article, I will demonstrate how to work with Editors, how to store the HTML content into the database, and generate the PDF using Kendo UI in ASP.MVC5. 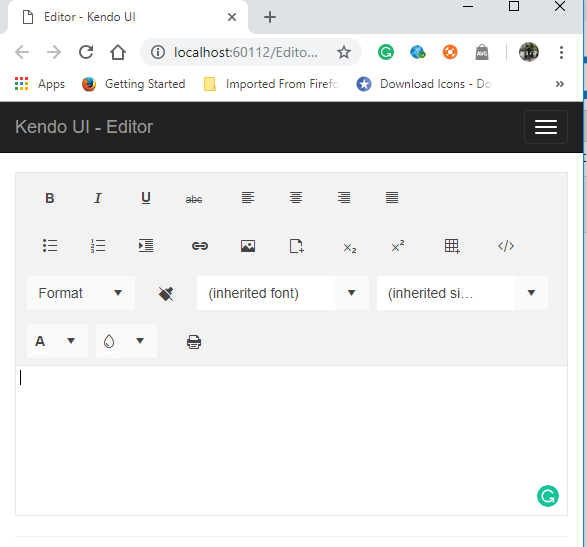 The Kendo UI Editor is a powerful WYSIWYG component that allows you and your users to create rich text content in a familiar and user-friendly way. It provides a variety of tools for creating, editing, and formatting text, paragraphs, lists, images, tables, hyperlinks, and other HTML elements. The component outputs identical HTML across all major browsers, follows accessibility standards, and provides API for content manipulation and exporting to PDF. To create ASP.NET MVC empty project, follow the below steps one by one. Here, I have used Visual Studio 2017. Select New Project -> Visual C# -> Web -> ASP.NET Web Application and enter your application name. Here, I named it "KendoUI_Editor". Then, select Empty MVC template and click "OK" to create the project. Once you click OK, the project will be created with the basic architecture of MVC. If you are not aware of how to create an Empty ASP.NET Web Application, please visit Step 1 and Step 2 to learn. 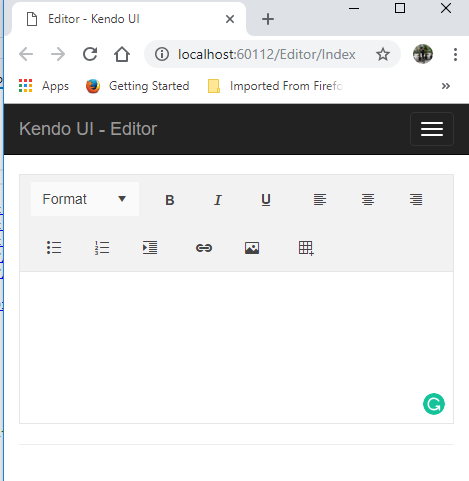 Here, we are going to enable the Kendo UI Editor features with our application by adding the below CSS and JS in the application. Before adding it, let's create the controller and action. Now, create an empty Controller and View. Here, I created a Controller with the name of "EditorController". Whenever we create an empty Controller, it is created with an empty Index action method. And, create an empty View of this action method "Index". Now, add the below Kendo UI JS and CSS in Index or _Layout page. Create a div in the View which will act as Editor. Here, I have used the text-area and mentioned the id for div in the name of the Editor. Now, enable the Kendo UI Editor features to div ("editor"). Set the default controller and action in RouteConfig.cs. Run your application. In the below image, you can see that the basic features of Editors are enabled. Now, we shall add a few more tools on this Editor to add more features. For that, Kendo provideds the tools property to enable these, as below. Before formatting the data in Editor, let's create the table in the database to store the contents. I have created the table with the below design in the name of EditorContents. Execute the below query to get the same design. Now, let's format some content using our Kendo Editor, as below. In the above image, you can see that I have added one Save button. So, add one button in your View as below. Here, I have already discussed how to configure and implement a database first approach. In the meantime, choose your created table with Entity Framework. Once we finish our configuration with SQL table "EditorContents" from CSharpCorner database and with our application, we will get the below screen as succeeding configuration. Write the Save Logic in the controller. Now, Pass the Editor value to the above action method using AJAX, as below. We should define the "Allow HTML" attribute while binding the value to a model property. Run your application. In the below image, you can see that we have stored the HTML content in the database. We have formatted the content, right? Let's convert this Editor content to a PDF document. Now, enable the PDF features as below. Refer to the attached project for reference. I have attached the demonstrated project without a package due to the size limit. 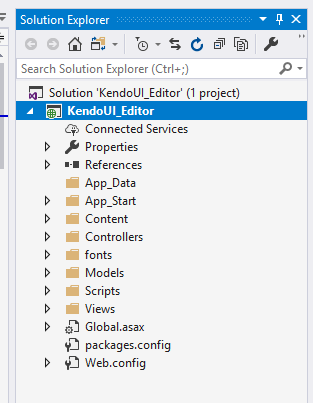 In this article, we saw how to work with Editors, how to store the HTML content into the database using Kendo UI in ASP.MVC5. I hope it helps you out. Your valuable feedback and comments about this article are always welcome.